Indomethacin is a nonsteroidal anti-inflammatory drug (NSAID) that reduces fever, pain and inflammation. It is similar to ibuprofen (Motrin) and naproxen (Naprosyn, Aleve). Indomethacin works by reducing the production of prostaglandins. Prostaglandins are chemicals that the body produces to cause fever and pain that are associated with inflammation. Indomethacin blocks the enzymes that make prostaglandins (cyclooxygenase 1 and 2) and thereby reduces the levels of prostaglandins. As a result, fever, pain and inflammation are reduced. Indomethacin is available in a sustained (slow) release form (Indocin-SR). The FDA first approved indomethacin in January 1965. 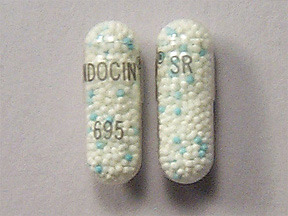 Indocin, a nonsteroidal anti-inflammatory drug, is used to relieve the inflammation, swelling, stiffness and joint pain associated with moderate or severe rheumatoid arthritis and osteoarthritis (the most common form of arthritis), and ankylosing spondylitis (arthritis of the spine). It is also used to treat bursitis, tendinitis (acute painful shoulder), acute gouty arthritis, and other kinds of pain. Indocin is used to relieve the inflammation, swelling, stiffness, and joint pain associated with moderate or severe rheumatoid arthritis and osteoarthritis (the most common form of arthritis), and ankylosing spondylitis (arthritis of the spine). It is also used to treat bursitis (inflammation and pain around joints), tendinitis (acute painful shoulder), acute gouty arthritis, and other kinds of pain.